Earlier this year we benchmarked the performance of NGINX Plus and created a sizing guide for deploying it on bare metal servers. 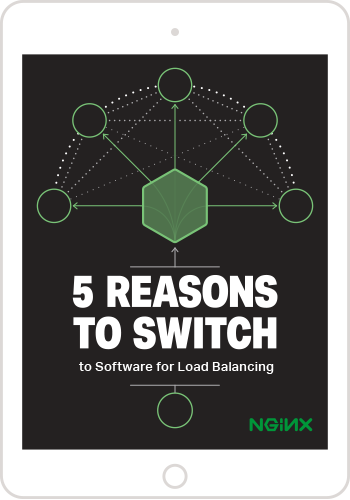 NGINX and NGINX Plus are widely used for Layer 7 load balancing, also known as application load balancing. The sizing guide outlines the performance you can expect to achieve with NGINX Plus running on various server sizes, along with the estimated costs for the hardware. You can use the sizing guide to appropriately spec out NGINX Plus deployments, and to avoid over‑provisioning – which costs you money immediately – or under‑provisioning – which can cause performance problems, and cost you money in the long run – as much as possible. We’ve had a lot of interest in the sizing guide, along with questions about the methodology we used, from customers and others interested in reproducing our results. This blog post provides an overview of the testing we performed to achieve the results presented in the sizing guide. It covers the topology we used, the tests we ran, and how we found the prices listed in the sizing guide. All tests were done using three separate machines connected together with dual 40 GbE links in a simple, flat Layer 2 network. To generate traffic from the client machine, we used wrk, a performance testing tool similar to ab (ApacheBench). All traffic was directed to the NGINX Reverse Proxy, which forwarded the connections to the Web Server backend. The following hardware was used for the testing. Version 4.0.0 of wrk running on the client machine generated the traffic that NGINX proxied. We installed it according to these instructions. Version 1.9.7 of the open source NGINX software ran on the Reverse Proxy and Web Server machines. We installed it from the official repository at nginx.org according to these instructions. Ubuntu Linux 14.04.1 ran on all three machines. Note: Although we developed the sizing guide specifically for NGINX Plus, we used open source NGINX for testing so that anyone can reproduce our tests without an NGINX Plus subscription. The tests do not exercise any of the enhanced features of NGINX Plus, so results for NGINX and NGINX Plus are the same. NGINX version 1.9.7 roughly corresponds to NGINX Plus Release 7. We tested the performance of NGINX as a reverse proxy server with different numbers of CPUs. One NGINX Plus worker process consumes a single CPU, so to measure the performance of different numbers of CPUs we varied the number of NGINX worker processes, repeating the tests with two worker processes, four, eight, and so on. For an overview of NGINX architecture, please see this blog. Note: To set the number of NGINX worker processes manually, use the worker_processes directive. The default value is auto, which tells NGINX Plus to detect the number of CPUs and run one worker process per CPU. Requests per second (RPS) – Measures the ability to process HTTP requests. In our tests, each client sends requests for a 1 KB file over a keepalive connection. The Reverse Proxy Server processes each request and forwards it to the Web Server over another keepalive connection. SSL/TLS transactions per second (TPS) – Measures the ability to process new SSL/TLS connections. In our tests, each client sends a series of HTTPS requests, each on a new connection. The Reverse Proxy Server parses the requests and forwards them to the Web Server over an established keepalive connection. The Web Server sends back a 0 byte response for each request. Throughput – Measures the throughput that NGINX Plus can sustain when serving 1 MB files over HTTP. The -c option specifies the number of TCP connections to create. For our testing, we set this to 50 connections. The -d option specifies how long to generate traffic. We ran our tests for 3 minutes each. The -t option specifies the number of threads to create. We specified a single thread. To fully exercise each CPU we used taskset, which can pin a single wrk process to a CPU. This method yields more consistent results than increasing the number of wrk threads. This test spawned one copy of wrk per CPU, 36 total for our client machine. Each copy created 50 TCP connections and made continuous requests for a 1 KB file over them for 3 minutes (180 seconds). The client opens and closes a connection for each request (the -H option sets the Connection: close HTTP header). The requested file is 0 (zero) bytes instead of 1 KB in size. The only difference from the first test is the larger file size of 1 MB. We found that using a larger file size of 10 MB did not increase overall throughput. The final step, once we had performance numbers with different numbers of cores, was to determine the cost of servers with the corresponding specs. We used prices for Dell PowerEdge servers with specs similar to those of the Intel hardware we used in our testing. The appendix below has a full bill of materials for each server, along with the full NGINX configuration for both the Reverse Proxy Server and the Web Server. The prices in the sizing guide are for the following Dell hardware configurations. Note: Server models with the indicated specs and prices were available at the time we ran our tests, but are subject to change in the future. For SSL/TLS TPS tests, we set the values for both directives so that connections stayed open for just one request, as the goal of that test is to see how many SSL/TLS connections per second NGINX Plus can process. SSL/TLS session caching was also disabled. For the RPS tests, the directives were tuned to keep connections alive for as long as possible. The configuration is a fairly standard reverse proxy server configuration otherwise, with NGINX Plus proxying to a web server using the proxy_pass directive. To try NGINX Plus yourself, start your free 30-day trial today or contact us for a demo.